When it comes to saree blouse, there are quite a few colors that can gel well with any saree. Gold and black are two stand out colors which have much to offer in terms of saree blouse. 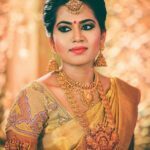 Imagine you are in the mid of styling your party wear saree and bumped up to realize that your matching blouse has fitting issues, then reaching for a universal flattering glittery gold blouse is the next right thing to do. So is black. It is such a darling color to be paired with any handloom or cotton sarees. 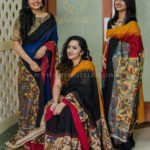 Take any deep or earthy shades saree and try to mix it with a black blouse; you will end up in an effortless saree look. That’s the charm of a simple black blouse. However, such a flexible blouse can be made even more significant by adding few details at right places. Take for instance, how actress Anasuya made the go-to black blouse look incredibly stylish by inserting chic style elements. It was a simple cotton saree and a statement black blouse Anasuya opted for the award night at SIIMA. What stood out in the overall look is the vertical paneled net blouse with a deep back neck and adorable tie back. Needless to mention the beauty of cute umbrella motifs that structures her waistline. Imagine the same saree without this arresting blouse, quite blunt, isn’t it? And now imagine the same blouse on any other handloom or cotton, or even party wear saree on deeper hues, the effect would still be astounding. Take this blouse inspiration and do play with your black blouse! Would you try a chic blouse like this for your sarees? Do let us know in the comments below. Why You Should Own a Gold Blouse? 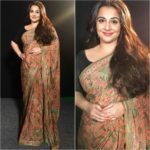 How Vidya Balan Styles The Black Blouse With 4 Sarees! Bipasha Basu Nailed the Perfect Floral Saree!